Takahashi FSQ-106ED @ f/5.0 (530 mm F.L.) Captured at 2.1 arcsec/pixel. Shown at 3.91 and 9.39 arcsec/pixel. Taken 8/6/2014 to 11/27/2014 Chino Valley, AZ. 168 min. (24 x 7 min.) "
196 min. (28 x 7 min.) "
364 min. (52 x 7 min.) "
CCDSoft, CCDStack, PixInsight & Photoshop CS6. eXcalibrator v4.36 for (b-v), (v-r) color balancing, using 75 stars from the NOMAD1 database. CCDStack to calibrate all sub exposures, register and stack the color and create the RGB image. PixInsight processing includes registering and stacking the luminance, RGB background neutralization, non-linear stretching with HistogramTransformation, and LRGB creation. PhotoShop for the final touch up. LDN 1247 and 1251 are two molecular clouds in the constellation Cepheus. 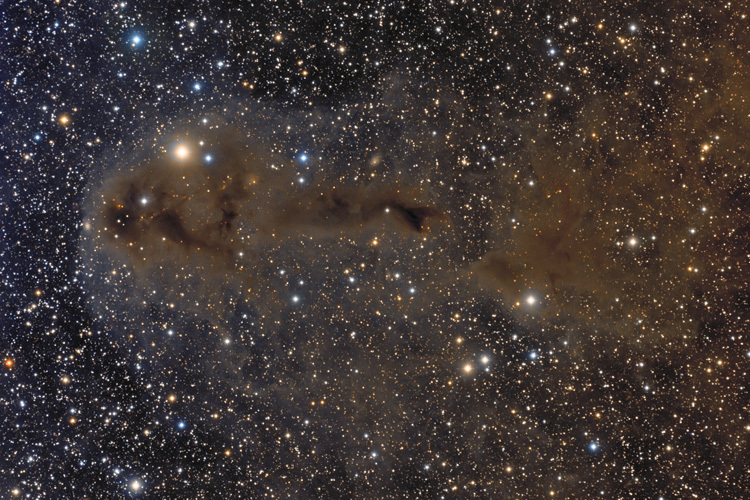 LDN 1247 is the smaller dark nebula just to the right of center. LDN 1251 is the larger elongated structure on the left. LDN 1251 contains about 15 Young Stellar Objects and about 25 YSO candidates. These are stars in the early stages of evolution. They are often associated with early star phenomena such as jets and bipolar overflows, masers, Herbig-Haro objects, and protoplanetary disks. There are several Herbig-Haro objects scattered about LDN 1251. In the 1940s, George Herbig and Guillermo Haro independently studied and identified these objects as a distinct type of the emission nebula. The nebulae are associated with newly born stars. Several are often seen around a single star and aligned with star's rotational axis.